Would you have any measurements please. Neill, The Superstructure of the Motor Sailer 20 (Hardy HM6) is the same and the Family Pilot 20 - there should be a few Family Pilot Owners nearby - I think Clice Ffitch is fairly local and he is on this forum - I'm sure Clive would be happy to measure his frame. Otherwise there is bound to be a Family pilot 20 near you - just make sure the mounting poistions of the canopy frame attachment (usually a track with slider each side ) is the same. I had a broken hoop with my old Navigator - but it was the wrong size anyway, so without any better ideas of size, I had a canopy maker bend some stainless tube at approx the right width - measured as just a couple of inches under the width between the canopy track sliders, and then had them leave the "legs" far too long. I then gradually trimmed the "legs" to fit. Remember the track sliders can be used to adjust the fit of the canopy and aid boarding with the canopy up - if they are corroded together as is common, Sheridan Marine sell the spares including "stoppers" not normally fitted as standard. Best Regards Simon. Neill Doubtless some Navigator experts will be along soon but I would have thought that the sequence should be frame first, then canopy to fit. Good luck with your Hardy; I'm sure it will give you a lot of enjoyment. Hi guys, I am new to the boating scene although 66. I have recently bought a Hardy 20 Motorsailor built in 1980. I am having a canopy made delivered in July, but the problem I have is that the boat does not have a frame, and I have no idea what the dimensions are, or what it should look like. Is there anyone out there who can help by emailing photos and sizes. Boat is in Saltash, Cornwall. Best Regards. A picture, showing the new fender and cover, both fitted this month. Hi guys, I have recently replaced the original cockpit canopy on my Navigator. I took the decision to fit a tonnaue cover, as the hassle of getting the full cover and frame down, whilst the boat is on a sinker mooring, seemed to outweigh the benefits of having a covered area at the back of the boat. I also didn't like the SS hoop hanging around at the back of the boat whilst under way. Personal choice I know, but I love the new cleaner look of the boat, and of course a new cover was significantly cheaper at £280 fitted. Hi Tony. 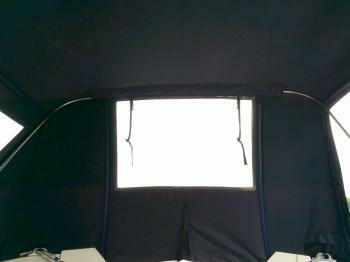 There are lots of companies that Supply canopies- and the prices vary. I know a few people who have ordered "mail order" from: www.nauticover.co.uk, I think the price is around £500 - £600 depending on the material you choose - but worth chatting to them - they may even have supplied a boat local to you so you can check their workmanship. I bought a canopy for my old Navigator directly from Shetland Boats http://www.shetlandboats.co.uk/ They bought a company called "Suffolk Trimmers" who used to make all the Hardy factory canopies - and most of the original staff are still there (with Shetland) - they have the templates, and I found the canopy to be tough and well fitting - the sunroof was a strong affair! I think both send the canopy clips and instructions on how to fit them to the canopy. 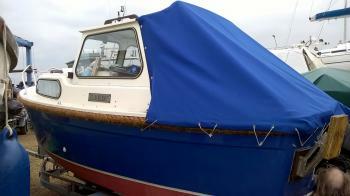 Most other companies can make you a canopy - but I don't know any local to you - have chat with your local marina. Best Regards Simon.